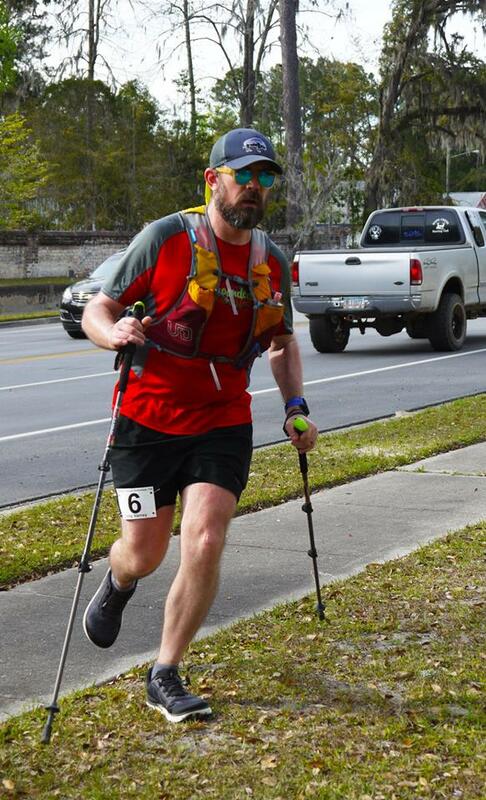 How do I even begin to wrap my head around the 2019 Coastal Georgia Greenway 155 mile ultra this past weekend and, how epic it was? Nine runners signed up for the 155 mile version of the CGG and one for the 100 mile version of it. At the end, eight crossed the finish line while two did not. The two that did not my heart goes out to them. I know how big of a deal this was to you both and I’m sorry that your race did not go as you had expected or hoped. Please be gentle with yourselves and come back when you’re ready. The CGG 155 and 100 are beasts. Any point to point race is tough. 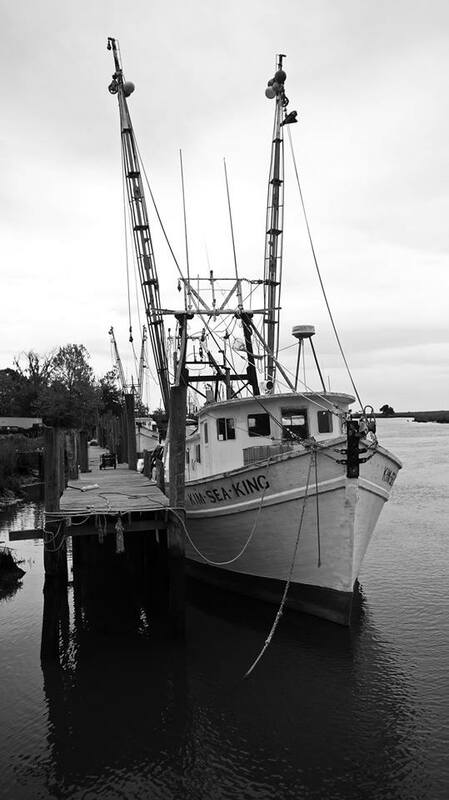 The CGG 155 starts in Savannah and follows the coast of Georgia, ending in St. Mary’s, a city a stone’s throw from the Florida border. A run like this quickly begins to tear down runners mile upon mile with so many potentially dangerous obstacles thrown at them. The CGG is a race that demands acute alertness and attention to detail. Runners have to navigate a tremendous amount of real estate. Throw in potentially sketchy sections of towns, road traffic and construction, narrow, to no road shoulders, -loose, unsupervised dogs and, an occasional feral hog and alligator along the way can add to the dangers of this long journey. Runners that decide to take on the CGG 100 or 155 must have a plan and, a contingency plan because things will happen that will challenge you physically and, mentally along the way. 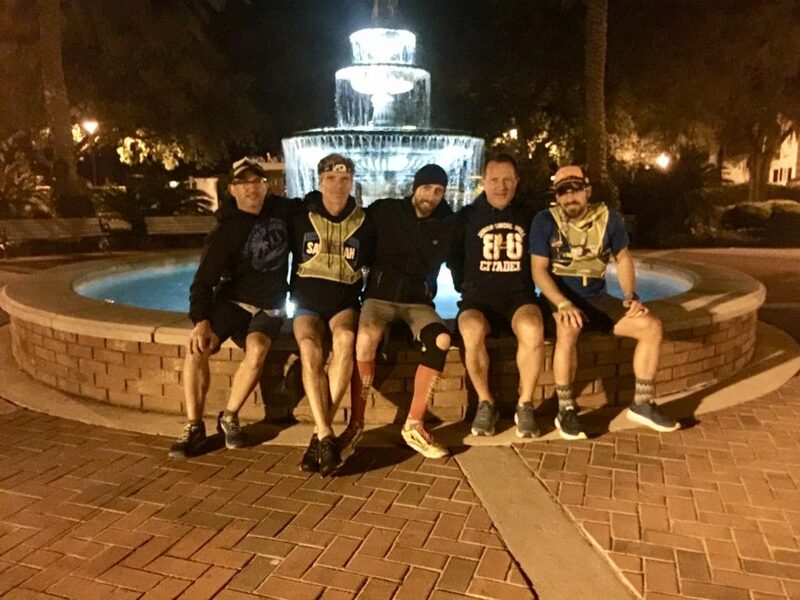 Having a strong running endurance foundation will make this journey a better, less painful experience as 100 and 155 miles of running in 35 and 60 hours (the cutoffs for the 100 and 155) are a heck of a lot of miles to crank out in a short duration of time. Mental endurance, though, may be the strongest skill set you bring to the CGG ultras. 100 and 155 miles on open roads from point to point, with traffic thick and light scattered through-out, lack of sleep, pounding asphalt through out the day and night, dramatic shifts in temperatures and climate, will tax the strongest of us and try desperately to break us down. And secondly, and perhaps most importantly, any runner choosing to run the CGG 100 and 155 should come with a crew on board and a finely tuned plan of execution. If there ever is a race where the success of a runner is pertinent to the quality of their crew it is this race. 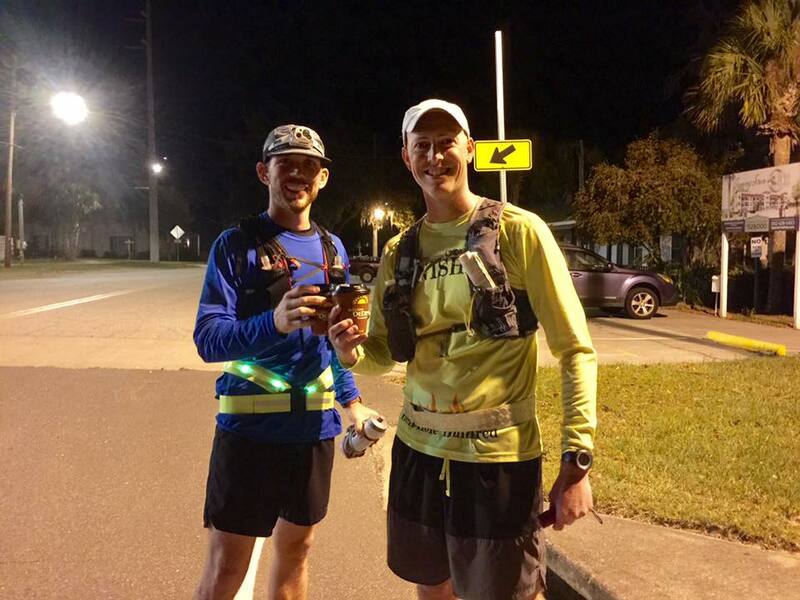 Friday, March 29th, the 155 mile runners began their run on Hutchinson Island and wound their way south toward St. Mary’s as most of Savannah was still stirring in sleep at 5:00 am. 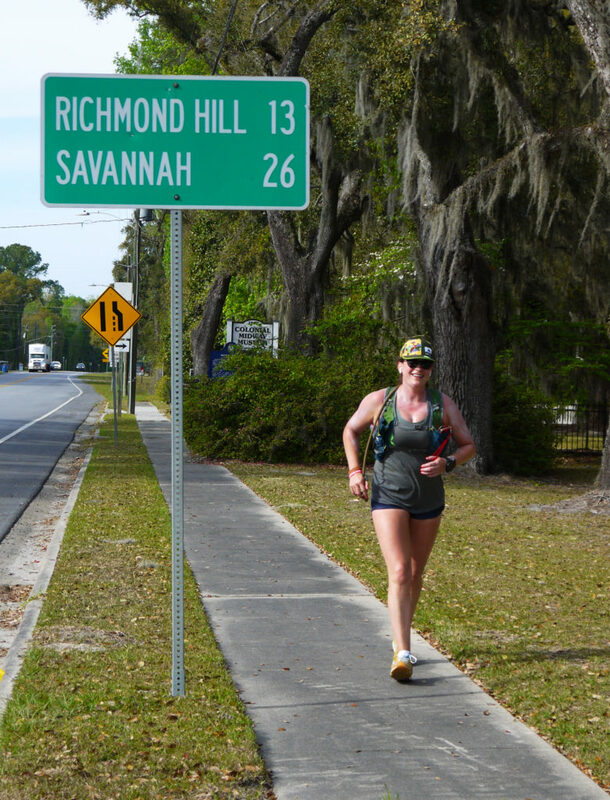 By the time they reached Richmond Hill, almost thirty miles from the start, the Coastal Empire was fully awake and highway 17 (where most of this journey takes place) certainly let the runners know that with so much traffic on the road. Leaving Richmond Hill behind them, the runners were given many opportunities to see and experience the southern comfort of rural, coastal Georgia. The runners ran through quaint towns, past farm land, over long stretches of marshland and rivers and, forests. All of CGG runners had their crews with them, inching up several miles ahead and ready to support their runner. The runner’s crew serves at the pleasure of the runner. That’s how its done. This year’s runners, ten in total, are the biggest group of runners we’ve had at this event. Managing a race with only ten runners with such a vast amount of geography proved a great challenge to Kerry, Jason and I (the RD trio of the CGG ultra) but we managed to pull it off especially because of the indispensable help we got from Scott Owenby. Having Scott join our team allowed us to spread out across the field and be at the locations we needed to be through out the race. Having great phone coverage also helped in communicating with everyone at all times during the race. The runner’s crews were amazing not just with their runners but with us, always keeping us abreast of where the runners were. Bren dug deep and finished at 45 hrs, 25 minutes. The line up of runners for this was quite diverse. There was our home town favorite, Bren Tompkins. He is such a genuinely good person. He works hard at everything he does. He is one of the most accomplished and fastest runners from Savannah. This run for him was very special. He was running in honor and remembrance of his older brother, Bo, who died last year of cancer around this same time. He was also raising money for a cancer cure, F*ck Cancer. 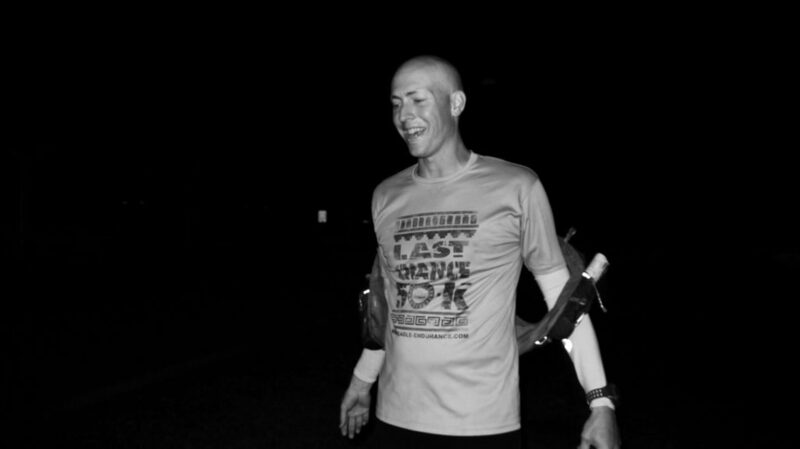 From the start, Bren ran like a champion, reaching the 100 mile mark in 19 hours, 19 minutes! That’s fast! After those hundred miles the race turned sideways for him. Running these great distances in a short period of time seems to be inexplicable to our finite minds. Hundreds of thousands of years of evolution cannot fathom why we purposely choose to run ultra marathon distances. So, the mind begins to break down as also the body does. Ultra running is not natural. Self-preservation is natural, though. And, I believe that is why the mind begins to betray our goals when we take on such big, difficult tasks. Those that can master their minds master their bodies and, go on and achieve these incredible ultra running goals. I’ve seen this same kind of mindset with mountain climbers. You set an incredibly difficult goal to achieve and you train for it physically and mentally….then, you go after inching your way up a mountain claiming little bits of real estate step by patient step until you reach the top. Every inch you claim is painful but you endure because to you, its worth it. With the help of an outstanding crew and pacers, Bren won the battle of the mind and forced himself to finish what he set to do. 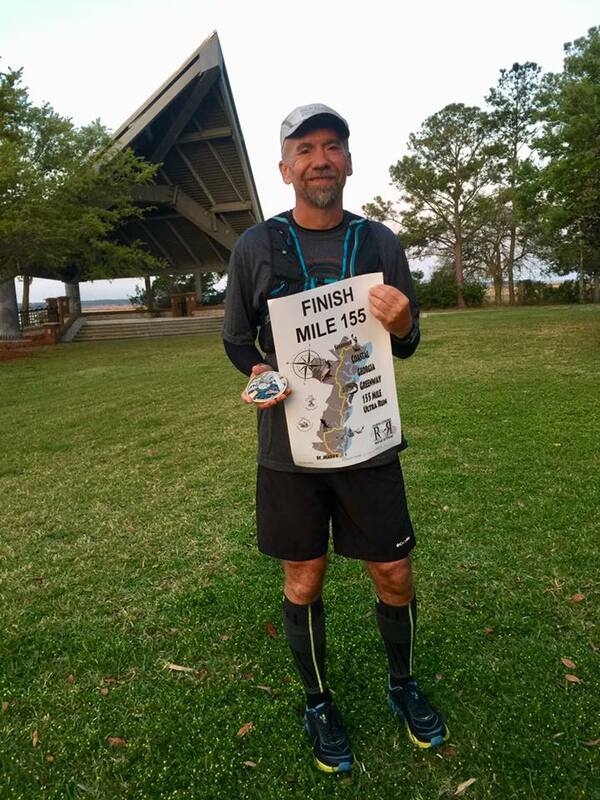 It took him 26 hours to cover the remaining 55 miles but he did it! Bren’s finish time was 45 hrs, 25 minutes. There is a lot to be said about that! I am incredibly proud and in awe of him! His team, though, deserves a tremendous amount of applause as he would not have done the impossible without them! 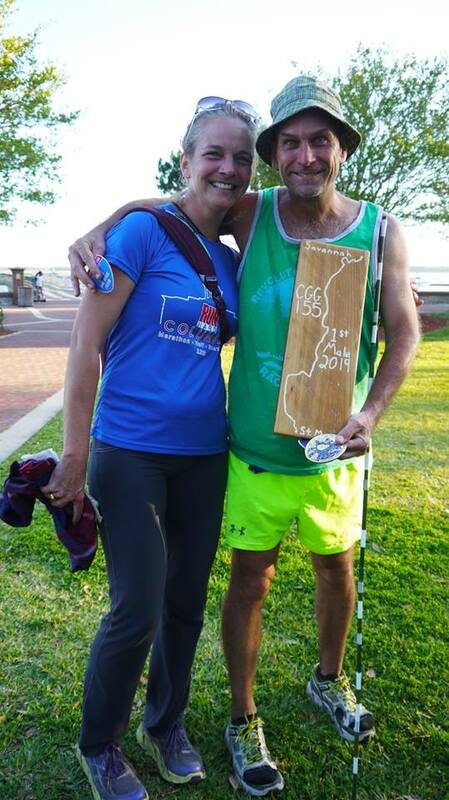 Joe Fejes with wife, crew mate, nurse and, fellow ultra runner, Kelley Fejes. At this year’s race we had the honor of having an ultra running living legend toe the starting line, Joe Fejes. Joe’s resume of races run is as long as an ultra. His running accomplishments would turn this blog into a novel if I were to write them all out. He is a current record holder for the 6 day mileage race (600 miles). 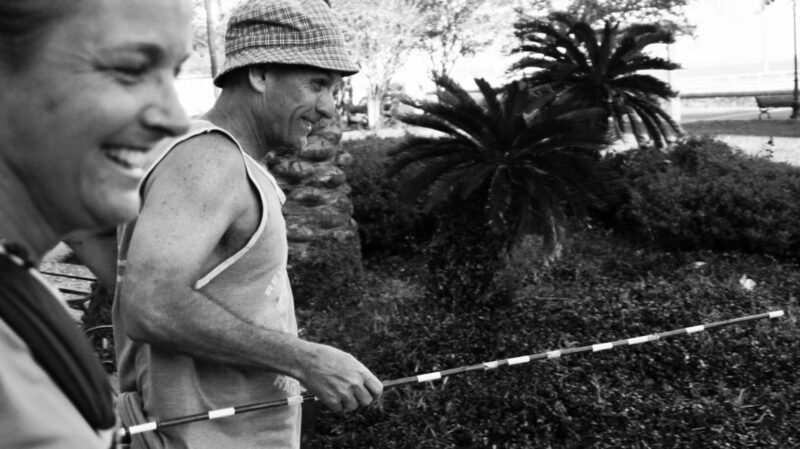 At 53 years of age, Joe proved why he’s considered one of the greats of ultra running. After having a rough start he found his groove and machined his way to the lead, finishing at 37 hours, 51 minutes…setting the second fastest CGG 155 finish time to date. In all due honesty, I am always so very grateful for anyone that chooses to run one of our Rough Runners races. I mean, there are so many races to choose from out there…that you would choose one of ours for your running goals is quite a meaningful thing to me that fills me with great gratitude. To have Joe Fejes run the CGG 155 kind of took my breath away. Up until the day before the race I had not personally met him. I knew of his reputation of being an amazing athlete and human being but I had never met him. I nervously shook his hand last Thursday. By the end of the weekend, I had come to see what everyone else has said about this man, he is as awesome of a runner as he is a genuinely good man. 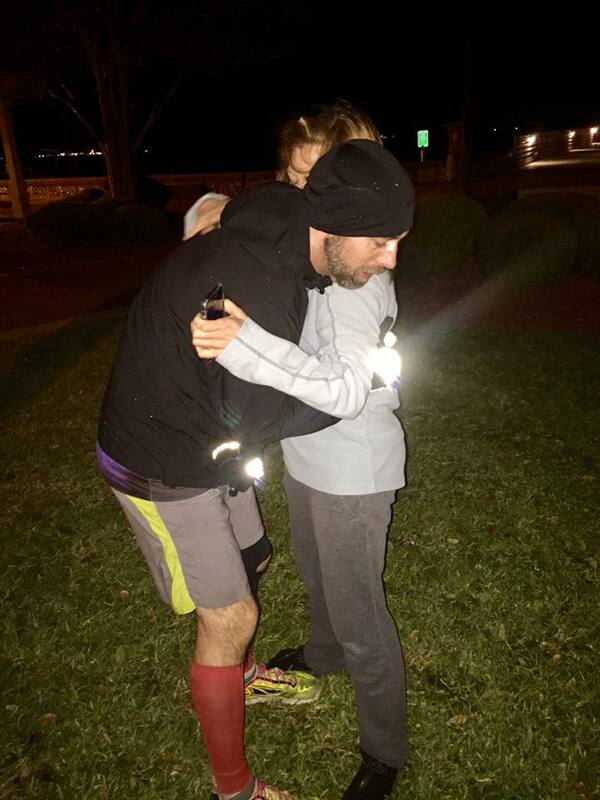 Speaking of a good man, Nathan Dewey, of Mount Pleasant was among the first to register for the 155 CGG ultra. I have come to know that Nathan executes races as does last year’s CGG 155 record holder, Steve Barber, -with a deliberate, well thought out plan of execution. He had studied the course and asked more questions than anyone else regarding the course. His race turned out pretty much as expected as he clinched second place overall with a finish time of 39 hours, 20 minutes. 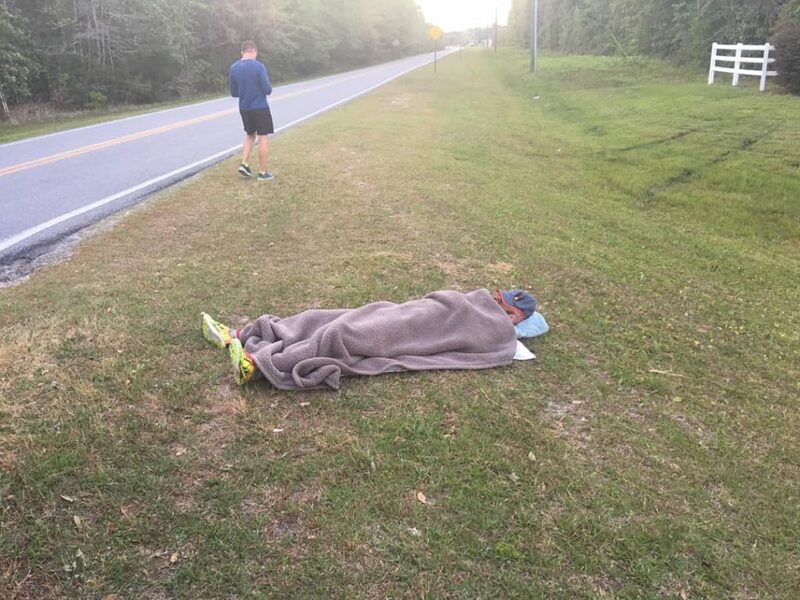 I remember Nathan arriving at the Darien checkin (mile 83) and saying that he could not hold anything down and had thrown up on his way to the third checkin. He then added, “that is to be expected..” After about ten minutes of small talk as he checked on his feet he gathered his stuff and, his pacer got him a cup of coffee and off they went…south, down highway 17, leaving Darien behind for good. Several hours after Nathan left the Darien checkin, ultra couple, Jesse and Paige Ausec arrived. The Ausec’s are one of the most wonderful folks I know. My gosh, I cannot tell you how much I love these two young folks. They are sweet and endearing. They are also tough as nails! The Ausec’s are such a wonderful couple. 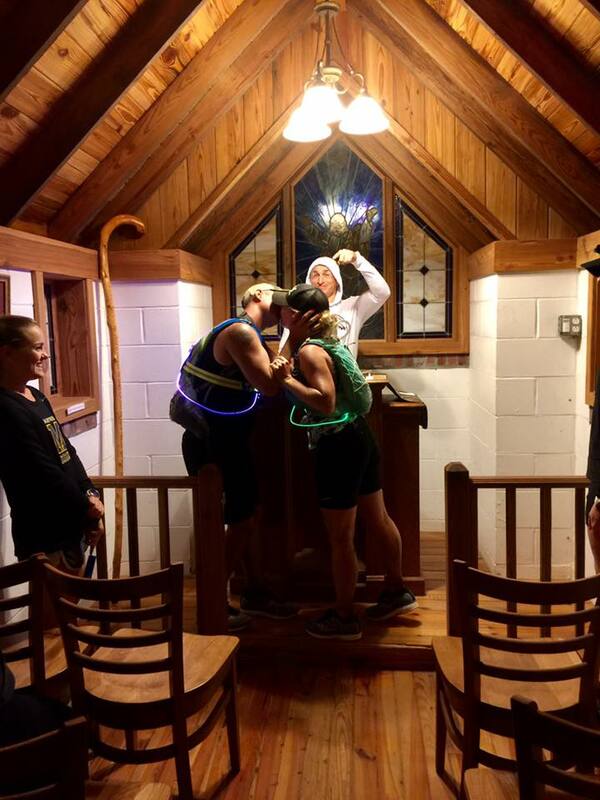 At the third checkin, which is at the Smallest Church in America (mile 58), they decided to renew their ultra vows. And, they asked me to officiate. Honestly, I was quite moved but at the same time wasn’t sure if they were joking. We entered the small church, -I stood behind the alter as Jesse asked two of their crew team to stand in as hand maids. He then took his lovely wife’s hand and asked me to say a few words. Not knowing what to say, I began rambling about these two and this moment and thanked God for them. Anyway, to make a long story long, Jesse gave me a look that to me, implied, enough! He then shared some words with Paige on how much he loves and appreciates her. They then kissed. Then, they hit the road together in the dark….with lots and lots of gnats chasing after them. It was magical moment that I will always remember. The Ausec’s taking a much needed 10 minute break at Darien, 84 miles done. The Ausec’s would go on to finish the run at 56 hours, 17 minutes with Paige taking first place female, also making her the second woman to finish the CGG 155. Paige, though, would not be the only woman to finish the CGG 155 this year. Maggie Seymour would join Paige hours later, making her the third woman ever to complete the CGG 155. Maggie, a former marine badass crossed onto the small patch of grass in front of the amphitheatre that signifies the finish of the CGG 155 at Howard Gilman Memorial Park in 59 hours and 14 minutes. She lay in a fetal position on the grass and exclaimed with a bright smile at learning her finish time that she still had 44 minutes to nap. Everyone laughed. Maggie kept a sense of humor through out the race. Her light-heartedness through out the run made her beloved by all that came across her. Maggie is also on a quest to run across every state in honor and for veterans and special needs athletes. Before the run she asked me of a charity that she could run for while doing the CGG and, I said, how about Georgia Conservancy? Well, she did just that and through her CGG run she raised over $600 for the Ga Conservancy! Maggie is such a joy to be around. Shane Tucker, a friendly but quiet high school teacher from North Georgia joined our gang and crossed the finish line in 50 hrs, 17 minutes. His parents and life long friend crewed him for the race. The Tucker family and crew were such a delight to be around. After Shane finished the run Kerry and I met up with the Tuckers at Cedar Oak Cafe and got to know them a little more. Such a wonderful family. Shane is a veteran runner and ultra runner. He has cranked out some big ultras and, the experience on taking on this beast, the CGG, proved it. Shane did not run very fast but his pace was constant and deliberate. Tony Varney entering checkin 2 at Midway. Rounding out the CGG 155 finishers was another local favorite, Tony Varney. Tony is such a kind-hearted man that everyone loves. He is also, tough as nails! A 155 mile race is never going to be easy and he knew that going in and, he battled with every inch of real estate he gained. Amid tears, Tony would find humor to help him out during this struggle and, to put a smile on everyone’s face. Tony is also a local race director holding two very popular ultra races (Madder Marsh and Badder Marsh) that give all of the proceeds to very worthy charities. Just as Bren dug deep and tapped into a secret volume of strength from deep inside so did Tony. During this race, Tony reminded me of Rocky Balboa from the first Rocky movie. He just kept getting up and coming for more. I am so impressed at his determination and strength! Tony was my hero for this race. In the end, I wish every runner had completed their race. The races Rough Runners hosts are tough but they are not designed to break runners. These races are challenges that we personally want to do and succeed at ourselves. I mean, I have two failed attempts at completing the CGG 155. Failure never feels good but it is a great teacher and, if you learn from her well you will get back on your feet and not let her keep you down for long. Failure at some point plays a crucial part in making success meaningful. I hope Lindsey and Soleil bounce back quickly, -regroup, come up with a new plan and get back out there and go after their big goals again. 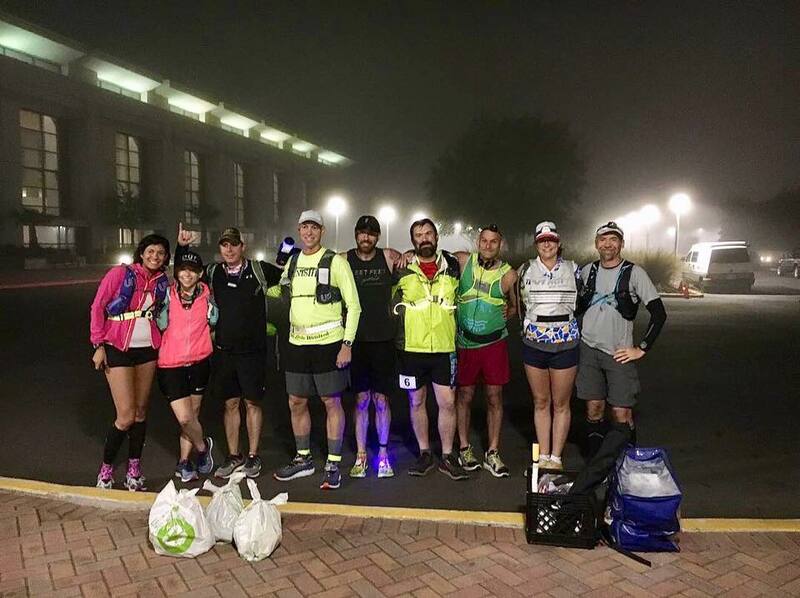 Having ten folks running the CGG which is better known as the East Coast Greenway brings attention to another goal we have and that is to have a greenway run through Georgia where runners, hikers and cyclists feel safe. The way to do that is to have a separate path off of the road as much as possible. Please support the East Coast Greenway. As for CGG 155 2020, we hope it gets bigger and more competitive. The Georgia Greenway is an ambitious project that can do so much good for the communities that the trail goes through. It promotes healthy living. It also promotes ultra running to the world and, hopefully, also economic opportunities for all of the counties impacted by the greenway. It’ll probably be a month before we open the 2020 race for registration. We’ll keep you all posted if interested.